The Westwood home at 2134 Malcolm Ave., LA CA 90025 lasted 31 days on the market before receiving an accepted offer on 11/14/09. The home was listed on 10/14/09 for 899,000 and received one price reduction down to $885,000 during the listing period. 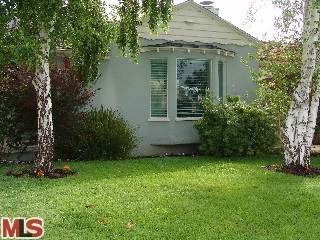 2134 Malcolm closed on 12/30/09 for $860,000. The home was previously listed on 4/1/09 for $1,099,000 and spent 155 days on the market, ending at $995,000. According to the MLS, the home is a 3 bedroom / 1.5 bath, 1,442 sq ft home on a 5,400 sq ft lot. The house is located on the east side of the street about 5 houses north of Olympic Blvd. The overall condition inside is very clean, but original with its kitchen and baths. There looks to be an add-on bedroom in the rear of the house (Buyer to verify permit). What makes this not as functional is you have to go through the 2nd bedroom to enter into the third bedroom. A jack and jill bathroom also divides the two rear bedrooms.